He added that the country holds an enviable and strategic position as the link between the South American continent, the Caribbean region and the rest of the world. The President’s remarks, which were made at an investment seminar, organised by the Caribbean Council in London, Tuesday, were supported by Mr. Gil Holzman, President and Chief Executive Officer of ECO Atlantic Oil and Gas. That company has a stake in oil and gas exploration in Guyana. President Granger and Mr. Holzman were part of a panel, which included Minister of Foreign Affairs, Mr. Carl Greenidge; British High Commissioner to Guyana, Mr. Greg Quinn; and Mr. Andy Thorne, Group Chairman of the Kestrel Group, which is involved in the shipping industry in Guyana. The session was facilitated by British Member of Parliament, Lord Bruce of Bennachie. In the audience were business executives from infrastructure, port development, oil and gas, tourism and hospitality and shipping, who are already operating in the Caribbean and Guyana or are interested in doing so, along with Members of the diplomatic community. The Head of State sold Guyana as an exciting investment destination with several advantages and opportunities. “We have the land, we have an intelligent English-speaking population, we have the resources, and I think people who are looking for something different; something unique, will come to Guyana. “I am not suggesting that you leave Belize or Antigua or Barbados but I am suggesting for long-term development, Guyana is the best prospect for investment,” he said. President Granger painted a picture of Guyana’s potential and the ‘green’ State development policy, which would see it taking advantage of its eco-tourism product, preserving its environment, pursuing ‘green’ energy development while taking advantage of coming oil and gas revenues to accomplish these goals, declaring that even as the country transitions, it has to ‘walk on two legs’. “Oil and gas is a very attractive prospect… We probably wouldn’t start to produce oil and gas till maybe 2020… We will continue to develop our sources of renewable energy and at the same time use the revenues from the petroleum industry to funnel our development of infrastructure and education in particular, and ensure that other industries could be diversified away from what we call our six sisters; sugar, rice, bauxite, timber and gold and diamonds. ”Oil and gas is not going to distract us. We are going to ensure that the revenues… go into our Sovereign Wealth Fund, but we will also ensure that we continue to become a ‘green’ state by developing our sustainable energy resources,” President Granger said. With the need for cheaper energy to boost the manufacturing sector, the Head of State outlined Guyana’s energy generation potential and called for investments in solar and wind energy, biomass and hydropower. “We can generate electricity from about 100 sites… We have huge savannahs and the sunlight is sufficient to generate electricity in many of our hinterland communities… We are the largest CARICOM [Caribbean Community] sugar producer up to the present time and although there have been uncertainties in market in the European Union, we still have a viable sugar industry, which can generate enough biomass to produce energy,” he said. Even as the administration works to steadily improve Guyana’s reputation as an attractive investment destination, President Granger told those gathered that progress is already being made, with regard to the legal and regulatory environment. This, he said, combined with the fact that Guyana, the only English-speaking country on the continent of South America, has a similar common law, parliamentary system and institutional infrastructure that can be found in other Commonwealth countries means that there would be some ease of doing business for companies from those parts of the world. “We can assure that your profits can be repatriated. We can assure you that our legal system, our Judiciary, our Ombudsman, our Auditor General, our elections are all entirely in consonance with what is required in Western Europe and the Commonwealth. “Only last year we had our Local Government Elections, which under the previous administration had been suspended for nearly two decades. When the elections were held, we created three new towns. The urbanisation of our hinterland is proceeding apace. ,” he said. Supporting this point, Minister Greenidge said that prior to the 2015 elections, there were serious concerns that the device for setting rules and for allocating resources in the various sectors were less than transparent and that there were instances of discrimination, as a result of a number of factors including corruption. “This is something that the current Government has been mandated to address… regulations have been changed, laws have been amended in a wide range of ways, including in relation to money laundering and funding of terrorism, legislation pertaining to the mining sector and the updating of legislation in relation to forestry and the like,” he said. From the foreign policy point of view, the President spoke of the various regional and international bodies with which Guyana is affiliated. There are the Union of South American States (UNASUR), the Organisation of American States, CARICOM, Common Market of the South (MERCOSUR), Community of Latin American and Caribbean States (CELAC) and the United Nations. He also updated the gathering on the Guyana-Venezuela border controversy and assured investors that the matter is on its way to being resolved. 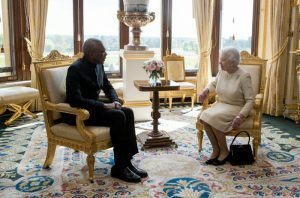 The Head of State met with Queen Elizabeth II yesterday, at Windsor Castle. This is an epic photo of an old and failing uncle tom in the great presence of his owner. Has me thinking of a conversation along these lines. uncle tom: “y-e-s, y-e-ss…ALL HAIL TO MY POWERFUL QUEEN, says tom in a loud squeak. I ddd-ii-d, I d-d-d-oo, I WILL do above and beyond what you even want me to My Most Honorable Queen of ALL Queens. Yyy-or every wish is my command”, says uncle tom trying hard to maintain a loud squeak. Her Majesty: “Good, good, dear tom. I know you are loyal to the bone. How are the old bones? Never mind, I don’t care to know. Go now, tom. You have a lot more to do. Report to Greg Quinn when you get back. You do remember who he is, don’t you? Sometimes I wonder if you’re up for the job…well, well, tally along now. I’ll have Quinn fix that when the time comes. Forgetting that the Queen is even older, is held in the deepest respect for her service to the Commonwealth and has been the glue even when Governments come and go. No one is befuddled as to critical analysis of the powers that be but rather her than the likes of the last corrupt government.. who had a long, long way to go to being even civilized.